Cost: $80 per rod for the day. 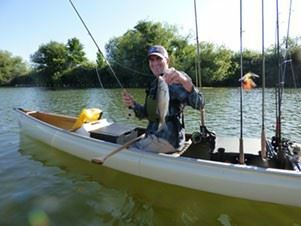 Meet Matt Guthrie (Headwaters Kayak & Fly Fishing) at Paradise Point at 8095 North Rio Blanco Road, Stockton, CA @ 6 AM. (some may want to stay at local motel on Saturday night). This is a guided one-day trip. Matt will provide kayaks,flies & fly-fishing gear (up to 8 set ups) for the trip. Plan to fish for striped bass early, come back for brunch/lunch at the launch area (late morning), then go back out till early afternoon to focus on largemouth bass.